Here's a fun fact. The first real post I ever wrote was a review of the first Indie Gala, which kicked off my now beloved trend of bundle reviews. I liked it. The included games were excellent, and it was a great value. I said at the time that it was basically a Humble clone, and it kind of was. But it evolved a lot since I made that post. The biggest niche it carved out was by later adding several electronic music albums. While soundtracks are nothing new for the other bundles out there, Indie Gala was unique in that it added game influenced music instead of OSTs. It's a really cool niche to make, and I now know lots of people who buy it for the music alone. 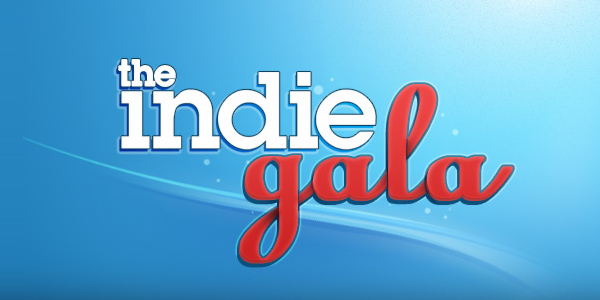 But Indie Gala is evolving again, this time with their new release cunningly titled Indie Gala 2. But what does Indie Gala 2: Cruise Control do differently? The games are still all Steam titles, so no DRM free versions, and all the titles are Windows only with the exception of Fortix 2. But there's lots of little things they've changed, such as offering a profile page for downloads similar to Humble and Indie Royale, a much needed improvement from the email system before. There's also a tiered system with three games and three albums for any price, five and six for minimum of $3.99 and Indie Gala 1 minus Saria as an extra for a minimum of $7.00. They are also limiting the number of bundles sold instead of setting a time limit, so I should probably stop wasting time and get to the reviews, yeah? Skip past the break for an introduction to Indie Gala 2: The Quickening. Here's a tricky conundrum. Most of the games in the Indie Gala 2: All Saint's Day are really quite simple, with not a lot of depth. They're not bad by any stretch, but it's difficult to get into the kind of depth I usually try for in my bundle reviews. But we'll give it a shot, and see just how much I can say on a match-4 game. Critical Mass is a match-4 puzzle game with a twist, which isn't much of a twist at all because pretty much every match-3/match-4 puzzle game has a twist these days. But the twist in Critical Mass is a good one. 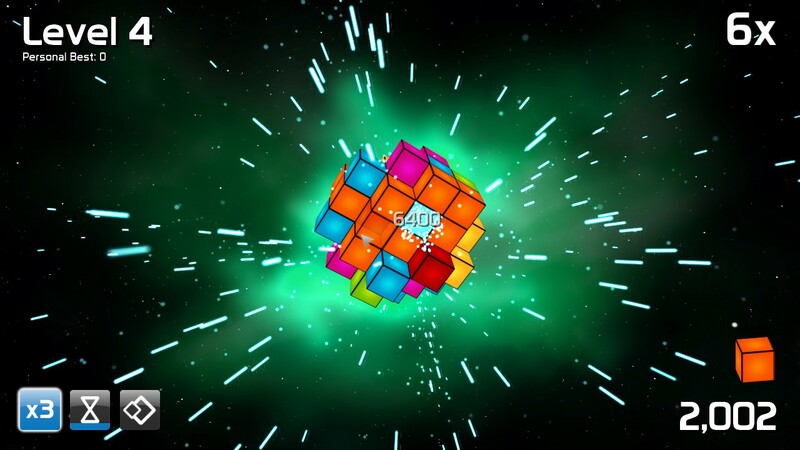 The game has you dropping coloured cubes onto a 3D mass, trying to match four or more in order to remove the blocks. 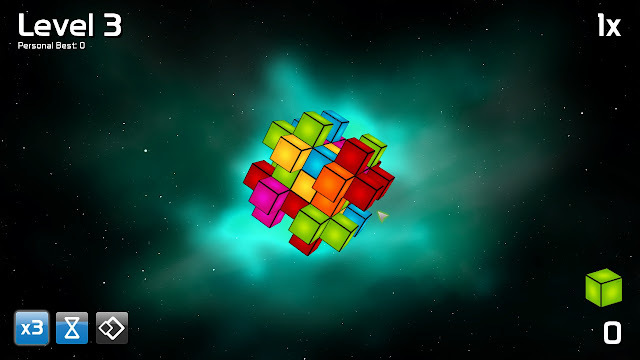 The mass of blocks is in full 3D and fully rotatable, adding a scavenger hunt like aspect to the games as you furiously tilt your misshapen mass of bricks around to find better combos. I say furiously, and I mean it. In the regular mode of the game, the mass slowly increases in size until you reach an aptly named Critical Mass. At this point, it's an instant game over. Placing many blocks without combos makes the growing rate skyrocket, but making combos of four or more forces the mass to diminish in size. So while you can set up massive chains of colours, it's important to keep an eye on your expansion. It's not easy though. You really have to be on your toes to have any chance of getting a good score. There are other modes that are pretty straightforward, including a time limit free meditation mode and a never ending survival match. But one of the better features in Critical Mass is the score tracking. You can either play the game in practice mode, where scores are for your eyes only, or the other option which is a ranked play that has you earn and lose skill points, ranking your block matching skills worldwide. It's completely integrated into the game and it actually suckered me into a few extra rounds to try to move into the top scores. Minor complaint time: it seems somewhat poorly optimized. I have a really great computer that can run most games smoothly, but my computer chugged on this game until I turned down the resolution and graphics. Which is curious, because this is a very simple casual puzzle game and it seems weird to have such high expectations in terms of specs. But if you're bored of your favourite matching puzzle jam you should check it out, even at a lower resolution. Hey, you ever play Qix before? It's that game where you have to chop off chunks of the arena while not letting you or your trail be hit by a spastic monstrous being known as the Qix, which due to hardware limitations is represented by a bunch of multicoloured lines. 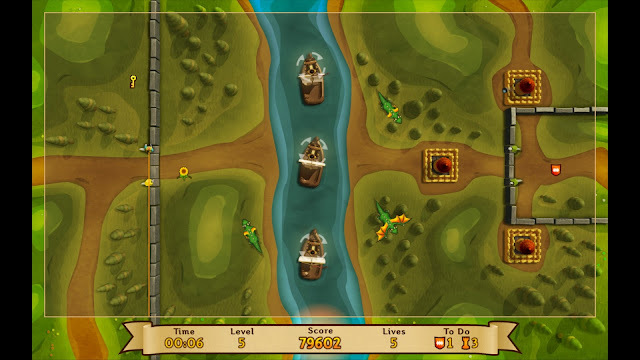 Fortix 2 is also that game, or at least a heavily updated reskinned clone of it. So what exactly does Fortix 2 have over that free version I just linked? Let's run it down. Better graphics: I don't care how nostalgic you are, the primitive graphics of Qix kind of take away from the amusement. Fortix 2 has a clean and fairly nice art style, and more importantly has enemies that have easier hitboxes to track. Forts and buildings: Probably the biggest deal, and the best improvement on the original formula. Over the course of each level you have to deal with impenetrable walls and stone slinging towers. To do so usually involves capturing a section of land with either a key to open a gate or a catapult to blow up said tower. This makes each level fairly unique, and gives the game a bit of an attrition element to things. Mostly you have to slowly capture important sections in order to give yourself access to more of the field. It's a great addition that pretty much sums up the key thing Fortix 2 adds to the formula. It's fairly difficult and prodded me to ragequit at least once, and the limited number of levels goes by fast. But the Qix formula is a solid basis for a game, and while Fortix 2 doesn't reinvent the style it certainly polishes it. 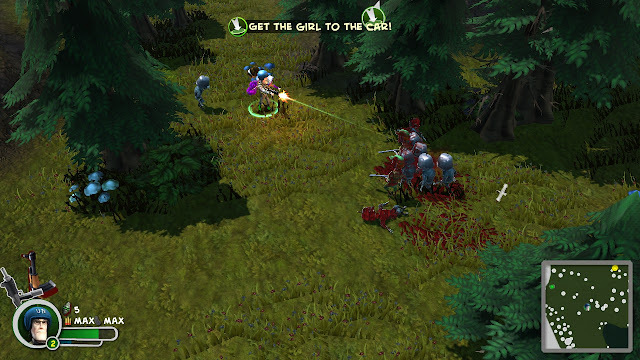 Bunch of Heroes is a twin stick shooter, and not a bad game under ideal circumstances. It basically follows the exploits of four action hero archetypes as they perform wacky missions and sprout wacky dialogue to kill the wacky zombies and save the day. Aesthetically the game looks fairly nice, with a 3D cartoon style that certainly suits the subject matter. Gameplay is similarly clean and simple; it's pretty much just shoot everything that moves while you run to the goal dot. 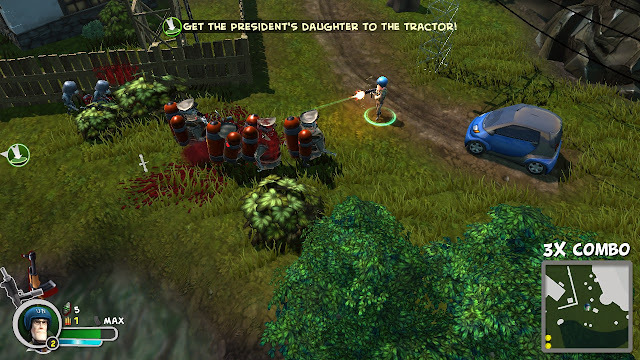 Luckily, to avoid tedium the game includes several variations on weapons. Though there's nothing completely original and wowing, there is a fair amount of unique inclusions; a variation on a buzzsaw gun makes it in, as does my personal favourite imaginary weapon: the exploding crossbow bolt. There's definitely a story developed behind the game and the characters, but it's not all that obvious in the game beyond "Go get em, tiger." The goals in each episode tend to just be random dude shooting related tasks with little continuity or impetus for completing them beyond the desire to shoot more dudes. Maybe the dudes are attacking a car or infesting a corn field or chasing a cheerleader, but almost every interchangeable task is resolved with the judicious application of bullets to dudes. So it's mindless, and I've proven quite clearly that I don't mind mindless games. But Bunch of Heroes just doesn't manage to be complex or different enough to hold a single player oriented person's attention for a while. For example, take Left 4 Dead. Bunch of Heroes has a very similar structure, with episodes divided into missions over various overarching themes. Now picture Left 4 Dead singleplayer, except you don't have any teammates. The game is both tuned and designed for coop, and it just doesn't feel right on your own. If you have some extra people to join in on your fight things would become a lot more fun, because shooting things with friends is inherently fun. But on your own the game suffers for it. There are a few minor extra points I should fit in while I can. The game controls fine with a keyboard and mouse, but not amazingly so. You're much better off with a 360 controller, and even the interface seems to think so (press a to select!). Secondly, the decision to use on screen text pop-ups for dialogue is kind of annoying. It's difficult to read the jokes your character is making when those darn zombies are clawing at your face. So while they're nothing really bad about Bunch of Heroes, there's nothing to make it stand out either. It's a pretty solid twin stick shooter, no better or worse than most. We're now entering the $3.99 and up games. So get out of here, cheapy. The premise to Roboblitz is very cool. You are a robot, and you need to fix a giant laser to fend off space pirates. 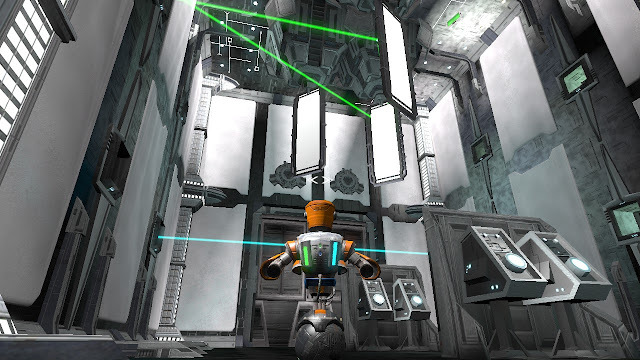 It's a hub based puzzle platformer than requires you to travel to different levels from a central hub, fighting enemies and solving puzzles to achieve your goals and activate another laser system. Along the way you unlock various weapons and upgrades to allow you to reach new areas and solve more puzzles. If you're starting to think this is basically Super Mario 64 plus Metroid plus physics puzzler, you pretty much nailed it. It's a really neat structure and a dream design for a game. The levels themselves are similarly imaginative, with lots of varied goals and layouts, and plenty of secrets to discover. Despite the cool premise, I'm going to talk about The Ball, so stick with me. Do you guys remember The Ball? 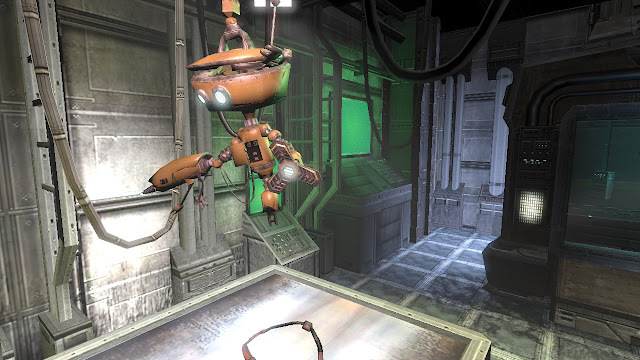 It's an indie puzzle platformer game built in the Unreal engine in which you control person who controls a ball. If you do remember it, you might also remember that there was something weird about it. Between the physics, the controls, the engine limitations and so on, the game felt slightly off at times. Roboblitz, also using the Unreal engine, managed to give me the exact same feeling. It's probably the shared use of Unreal and the fact that it runs awful on my compter. Here's a quick example. A major element is picking up and putting down various objects in the environment, but the physics fought me at every turn. Simply holding an enemy while climbing a ramp was an epic struggle of ridiculous physics animation and stuttering camera, and my framerate would drop every time sparks scraped off the floor. There are more examples I can think of, but I'll cap this off by saying that while animations and environments in Unreal look great, let's just accept that the physics are sometimes pretty awful. You may have much better luck or a bigger rig, but I would download the demo and see if your computer manages to make the game a little less janky than mine did. But honestly, the game is charming enough for me to try to push through the cranky engine. The non linear hub based gameplay and focus on upgrades combines two of my favourite game tropes, and Roboblitz looks really great beyond the aforementioned jankiness. It's charming and fills a niche I didn't even realize I wanted. If you have the graphics card to play it, you'll have a pretty good time, and there are just so many neat ideas packed in. I already had this bad boy, but it's still in my opinion the best game in the bundle. Greed Corp is a very simple turn based strategy game. Many people claim the game is simplified to a fault, and they kind of have a point; there are only three kinds of buildings and literally only one unit. However, I think the simplicity is what makes the game so great, as it manages to feel less like a video game and more like a well designed board game. I have to say, I'd play a physical version of this. 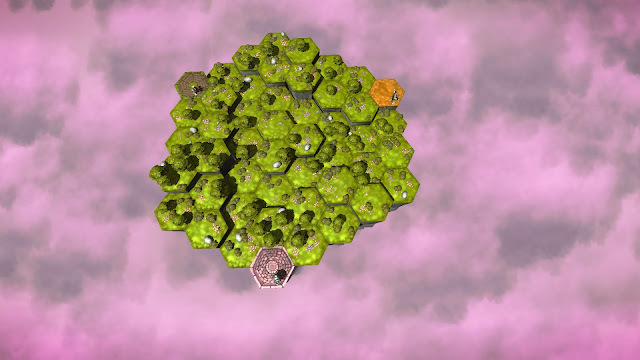 You play on a hex based grid of tiles with each tile at a certain height when the game begins. You have a small handful of structures to build. The most common is harvesters, which lower the height of its own and all other tiles around it in exchange for money until they break through the ground and fall into the sky. There are also cannons, which can fire an expensive shell to lower a distant tile by one unit of height. Most importantly for unit construction are armouries, which is where you build your singular style of unit and the sky vehicles that can transport them. 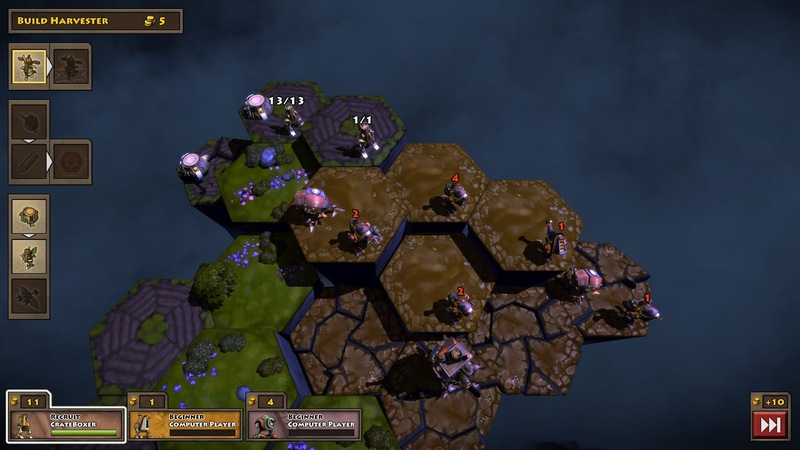 Your units can move in a stack of up to sixteen, and any tile they step on becomes one of your own claimed spots and allows you to build on it. Combat is very simple, with a one for one match up that leaves whoever has the higher stack in control of the tile. It's an extremely simple and easy to learn set of rules, but allows for a wide variety of tactics and plays. Hey, that sounds just like a board game. There are four armies to choose from and an eight mission campaign for each one, but the differences are purely aesthetic. Every player begins equally with no perks or changes. While it does eliminate a certain tactical dimension, it keeps the battles as simple as possible. If you tire of the campaign, there's a wide variety of extra maps that can be played against the computer or, even better, a cunning human opponent. Besides the simplicity, which I actually like, I can't think of any other complaints. The old timey piano tunes are hilariously disjointed from the aesthetic, but it's a style choice that works oddly well. It's crisp looking and runs ridiculously smoothly, and the various map layouts offer plenty to keep the game from feeling too repetitive. It's great fun, and even better with a friend. There are six extra downloadable albums, all very electronic influenced and catchy. I'm no music critic, but it's certainly a nice extra bonus for bundle adopters and the tunes are worthy enough of a download. But if it's more games you crave, you can pick up most of the first Indie Gala as well, with Zombie Shooter 1 and 2, Hacker Evolution Duality and its prequel, Your Doodles Are Bugged and InMomentum plus a bonus Robot Science album. As you can probably tell, I found that bundle pretty awesome and a bit better than the games offered this time, but luckily you can get both. Capitalism ho! So in the end it's not a bunch of games to set the world on fire, but it's still a great way to donate to charity. If one of these games calls out to you, there's still 37,747 Gala invites to go as of this writing. So skip on over and see if any of the three flavours of Indie Gala 2: Electric Boogaloo interests you.